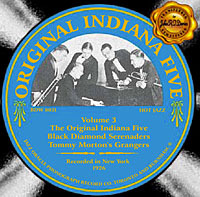 The third of four volumes by this band, including the Pathe recordings by two related bands, the Black Diamond Serenaders and Tommy Morton’s Grangers. The booklet includes notes by Mike May, as well as rare, newly-found photographs. Tom Morton (d) dir. James Christie (t), Pete Pellizzi (tb), Nick Vitalo (cl,as), Harry Ford (p), Tony Colucci (bjo). Tom Morton (d,k,v) dir. James Christie (t), Pete Pellizzi (tb), Nick Vitalo (cl,as), Harry Ford (p,v), unknown (bjo,g). Unknown (bjo, g) omitted; one of the musicians simulates a train whistle (tw), where noted. Same personnel, unknown speech (sp), where noted. Tony Tortomas (t), Pete Pellizzi (tb), Nick Vitalo (cl,as,bar), Harry Ford (p), Tony Colucci (bjo), Tom Morton (d). Tom Morton (d, k) dir. Tony Tortomas (t), Pete Pellizzi (tb), Nick Vitalo (cl,as), Harry Ford (p). Tom Morton (d) dir. Tony Tortomas-?Sammy Castin (t), Pete Pellizzi (tb), Nick Vitalo-?Gus Fetterer (cl,as), ?Bill King (ts), unknown (vln), Harry Ford (p), Tony Colucci (bjo), Johnny Ryan (v).